New Raceroom Series coming May 21! Sim Racing System Sim Racing System News New Raceroom Series coming May 21! We are delighted to announce the new series for Raceroom, starting May 21th! MK-Motorsport, a well known name in the motorsport industry, celebrates its 40th anniversary on the 1st of July. 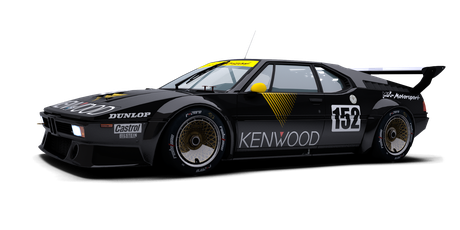 It is one of the most successful motorsport teams in the history of the BMW brand and its history is closely linked to the racing commitment of the unforgotten founder Michael Krankenberg. We invite all users to visit MK-Motorsport and learn more about their history and vast experience on motorsport. The Series will run from Monday to Sunday, 10 min qualify + 20 min race, at 02:00, 05:00, 08:00, 11:00, 14:00, 17:00, 22:00 GMT. This competition has weekly prizes and you can consult all the info at MK-Motorsports website. SRS will feature a daily series running 1 hour races with mandatory pitstop. Only thing is missing is multiclass. Great selection in general though. Has the Nordschleife problem been solved for the wtcc and gtr3 races ? What a nice work mates... i love that season. (05-19-2018, 07:13 PM)Alvio Lampis Wrote: What a nice work mates... i love that season. FWD touringcars is the area where raceroom shines and stands out as a sim, Two races a week is not good enough. Last series we only had one race a week, and i missed out on the final wtcc event at nurbugring, kept getting an error when pushing the join button in SRS client after a steam update prior to race. (05-19-2018, 10:32 PM)Lasse Oinas Wrote: FWD touringcars is the area where raceroom shines and stands out as a sim, Two races a week is not good enough. Last series we only had one race a week, and i missed out on the final wtcc event at nurbugring, kept getting an error when pushing the join button in SRS client after a steam update prior to race. And still no 20:00 race. A bit of a bonehead move mainly because 20:00 is peak hour in raceroom. 19:00, 20:00 and 21:00 are the peak hours (GMT). Why would you not have a race at peak hour? Literally when there are most players online srs decides not to have a race ... cmon. The "to focus more players on one race" is the shitiest excuse. I really dont get it. For me the series are fine but WTCC + GT3 + M1 would be ideal for maximum players. 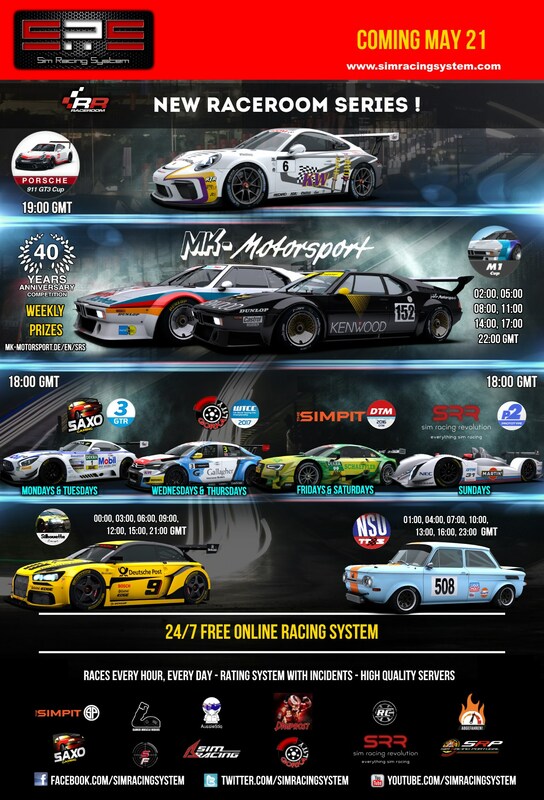 Error in the schedule "MK-Motorsport 40th Anniversary Special Competition"! Love the fact to introduce the Silhouette Series this season on a daily basis. This should attract more people because at least the Cars are free for everyone. I will jump into this series although times are not ideal for me (GMT+2), but that is a problem for many people and almost impossible to solve. As i was running the FRJ last season and very much enjoying (until after the patch nobody seemed to race anymore - me included) i was hoping for a daily open wheel series. But that didn´t happen. Hopefully next season with a rookie friendly open wheel serie (F4, F3). The 1 hour races are too long for me and because they are at 19 GMT, these Races will block the prime time segment. Last season this was the same problem. Because of that there is one less prime time slot availyble which is too badf. But maybe for most people the 1h races are a good thing. I don´t know. 20 min is perfect for me, though. The DTM category lasts 20 minutes and mandatory pitstop? It is right? 20 mins race, no mandatory pitstop. Must be wrong, I'll check and change. (05-24-2018, 08:12 AM)Rafael Jimenez Wrote: The DTM category lasts 20 minutes and mandatory pitstop? It is right?